The sun is one of the most dangerous carcinogens, yet people who work outdoors are inadequately protected. Since 2014, data on the UV exposure of outdoor workers (such as farmers, road workers, seasonal harvest workers, building workers, roofers, etc.) have been collected in Germany as part of the GENESIS-UV project – with alarming results. Sewer technicians’ exposure to sun amounted to 581 SED (standard erythemal doses), for example, and 494 in the case of façade construction workers . The SED (‘standard erythemal dose’) has been developed as an erythemally weighted measure of radiant exposure. The SED is independent of skin type, and the WHO has set a daily limit of 130 SED . It is now becoming apparent that this limit is routinely exceeded almost five-fold among outdoor workers in Germany, and yet Germany is not even one of the most sun-drenched regions of Europe. Nor do the figures relate to 2018 and its record-breaking summer, which also produced extremely high temperatures and much sun in Nordic climates, but rather to the previous, moderate summer. 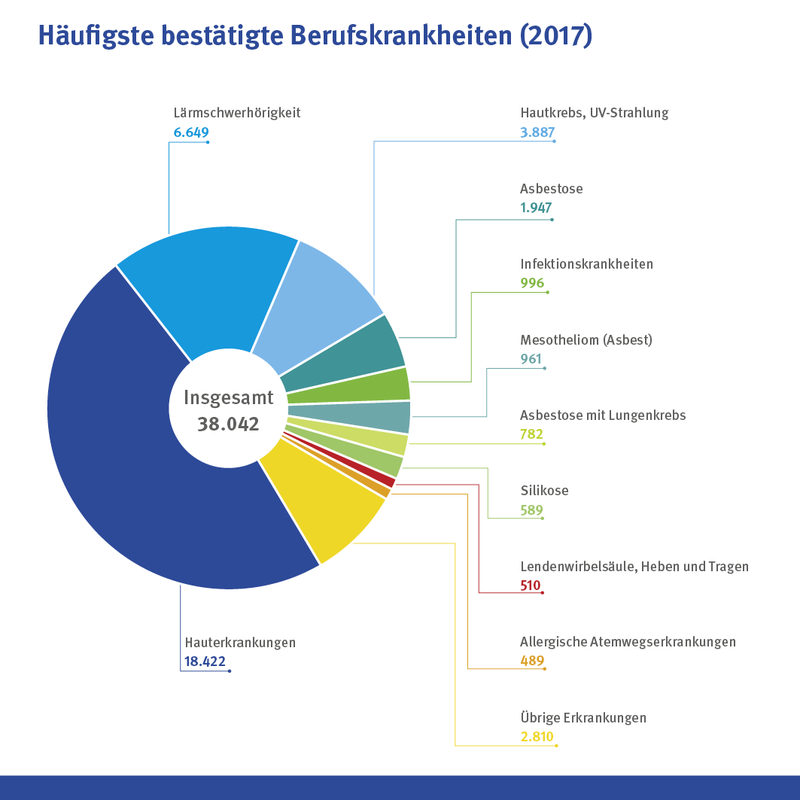 Recent statistics for skin cancer  show that exceeding the limit by a factor of five in a ‘normal summer’ is not without its consequences – 8,831 new cases of occupational skin cancer were reported in Germany in 2017. ‘A further increase in the future can be expected because of the sunniest summer in a century’, explains Professor Dr Swen Malte John, MD, Ph.D., Chairman Dept. of Dermatology, Environmental Medicine at the University of Osnabrueck (Germany), Chairperson of the EADV Media & PR Committee. Outdoor workers are a special high-risk group. It is well known that their risk of contracting a basal cell carcinoma increases by 43% and that their risk of contracting a squamous cell carcinoma is doubled. Compared to indoor workers, people who have worked outdoors for more than five years are exposed to three times the risk of developing a basal cell carcinoma, a squamous cell carcinoma or actinic keratosis . But that is not all – one study shows that outdoor workers also contract particularly aggressive forms of white skin cancer in many cases . Professor John continues by saying that the lack of information among the public is extreme. Most of those affected complain that they had not been informed either about the dangers of UV radiation or about ‘white skin cancer’ as a disease – neither by their employers nor by their GP. ‘White skin cancer has long been underestimated in the medical field as well, as can also be seen from the fact that the new ICD-11 catalogue, the international classification of all diagnoses, only now distinguishes between basal cell carcinomas and squamous cell carcinomas. This ICD-11, released by WHO in June 2018, will now for the first time allow to earmark skin cancer as occupational. The problem Europe-wide is that most cancer registries do not even register and analyse white skin cancer – and where such analyses are conducted, physicians do not report cases in accordance with the rules. In Italy, for example, a mere 96 cases of occupational skin cancer were reported between 2010 and 2014, which is remarkable because 15% of the population in Italy works in agriculture and exposure to sun is much higher on average than in Germany, for example. ‘The EADV therefore advocates standardized registration of all cases of white skin cancer and precise details of those cases that qualify as occupational disease. Only then can we determine the full extent and successfully establish preventive measures and regular health screenings of workers that are binding throughout Europe’, says Prof John. Such preventive measures could be easily established and in the view of experts should be integrated as a compulsory element of health and safety at work. Examples include: mounting sun shields at the workplace, avoiding outdoor work between 11 am and 2 pm, providing sun protective clothing and sunblocks (SPF 50+), and facilities for spending breaks indoors. The EADV Congress in Paris has opened today with an appeal from experts: “In our opinion, non-melanoma occupational skin cancer has already reached epidemic proportions that we can no longer ignore. Policymakers must urgently take action to counteract this development”.